Virginia Beer Blog: Stone Brewing RVA has a Website! Great news for Stone fans! The Escondido, California based brewer has launched a website devoted to the ongoing construction of it's new East Coast Brewery in Richmond, VA. The new website can be found here, and it has the details for the project and much more. From Richmond job postings, Stone's history and mission statement, community outreach, ongoing and available partnerships with local businesses, and even a time-lapsed construction feed from the Greater Fulton Neighborhood Brewery that they have vowed to update every Friday. It seems Stone Brewing Richmond is still on track for late 2015/early 2016 to start brewing, with a public opening to follow. Recently the brewer announced it will increase the brewing capacity of the new facility from the original plans, also adding it's commitment to solar energy and having the aesthetics of the new facility match the century old tobacco warehouses found in nearby Shockoe Bottom. 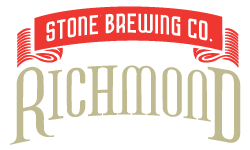 The Richmond location of their restaurant, Stone World Bistro and Gardens, is tentatively schedule to open within 2 years of the brewery.